Do you suffer from sun damage, acne scars, brown spots, fine lines and wrinkles or struggle with skin laxity and texture problems. 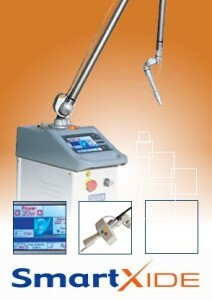 Then DOT SmartXide C02 Laser Skin Resurfacing may be for you. This CO2 laser resurfacing is the gold standard for laser skin resurfacing treating the effects of facial skin aging and promoting skin rejuvenation. With this latest laser technology, the DOT SmartXide CO2 Fractionated Laser offers many of the benefits of the traditional CO2 laser treatment with a fraction of the downtime. Prior to DOT technology, patients had to endure lengthy, uncomfortable laser sessions with long recovery periods in order to rejuvenate their skin. Several now-outdated treatments involved eliminating an entire layer of the skin’s surface, leading significant redness, discomfort and downtime. Additionally, old CO2 laser technology couldn’t easily treat non-facial areas like the neck and upper chest because those areas didn’t heal as well as facial areas. How Is DOT Therapy Different than Traditional CO2 Treatment? DOT therapy creates thousands of microscopic “dot pattern” perforations in the skin without affecting the surrounding areas. This process encourages quick healing from the edge of these tiny perforations. DOT therapy is faster, safer, and more efficient than conventional CO2 treatment. Dr. Perez has greater control to tailor the procedure specifically to your needs and even adjust the treatment during your procedure to adapt to any skin challenges or problem areas. A big reason why this system is so successful is that it stimulates new collagen production, which causes inner tightening of your skin. Although some results are immediately noticeable, you will likely see your results improve gradually over the course of three to five months following treatment. After your DOT CO2 laser resurfacing treatment, you can usually expect to recover fully in about three to seven days, depending on the level of energy used. The procedure is performed using a topical anesthetic (or mild oral sedative) and usually takes less than an hour to complete. Depending on the depth of treatment and the areas being treated, you may experience redness anywhere from 24 hours to two weeks following treatment. Most patients will see improvement with one treatment, however Dr. Perez recommends a series of treatments 4 to 6 months apart for best results. Those who suffer from significant skin damage may need more than one treatment or series of treatments to achieve their desired results. As with any skin rejuvenation procedure, best results are obtained by using skin care products containing Hydroquinone and a Retinoid before and after the treatment. Take a look at our before-and-after gallery to see what we have been able to do for some of our patients. For more information about DOT and other laser treatment options, please call 913-685-1108 to speak to a friendly team member today. Renue Aesthetic Surgery serves Overland Park, Olathe, and nearby Kansas City areas.